We came across an interesting essay today highlighting the informational usefulness of moves in the utility sector. The link to the entire report is here. The authors argue that movements in the utility sector contain important information with respect to the broader stock market. In the chart below, we have tried to capture the essence of the theme by comparing the relative performance of the S&P 500 Utility sector to the S&P 500 itself. 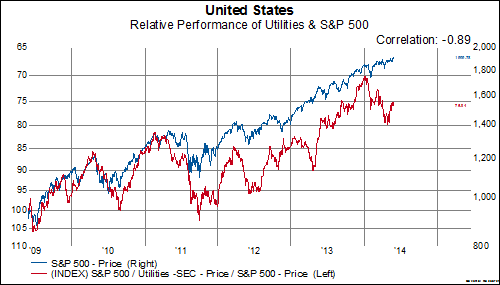 Over the last five years, there has been 89% correlation between the relative performance of the Utility sector and the S&P 500. This relationship takes on added significance when we consider that the Utility sector has been the best performing sector in the MSCI World index year-to-date.